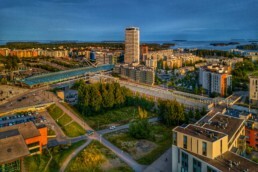 Vuosaari centre bathing in the evening sun – the highrise Cirrus, shopping centre Columbus and metro station. View towards south east. Helsinki. This photograph is part of my #helsinkifromabove series.